On the first anniversary of the Manchester Arena Bombing I created a large scale We Love Manchester art piece. 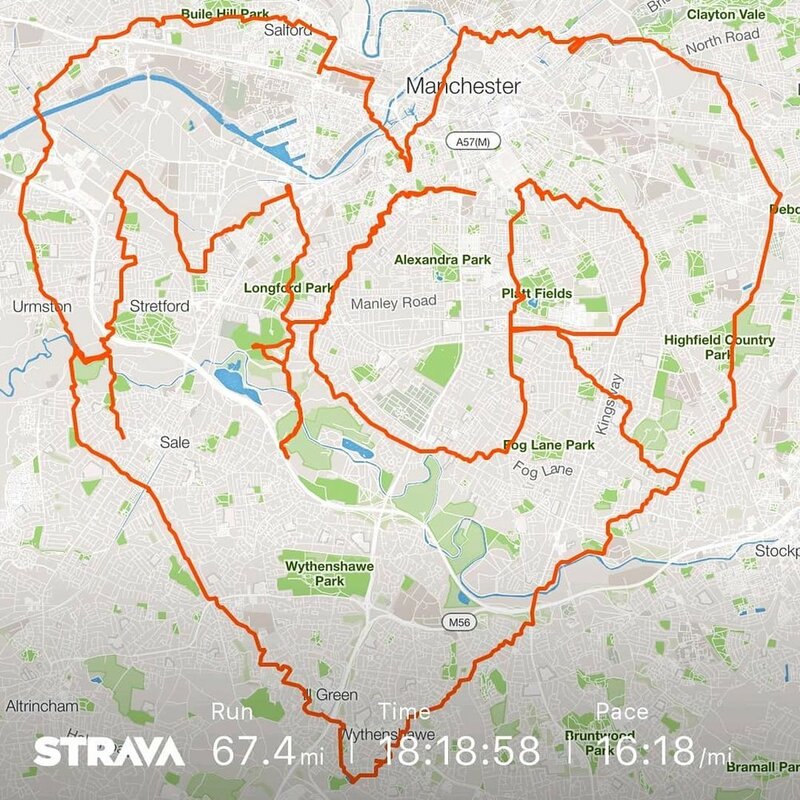 I ran a 67 mile long route making a #WeLoveManchester heart across the city, 8 miles high and 8 miles wide. The attack was sickening but I found our city's response to it inspiring and hopeful. I was just trying to capture a small part of that a year on. This is a video I made of all the people who met me on the run. It took over 18 hours to run the 67 mile line to create the letters MCR and the heart. The route snaked through Manchester, Trafford, Salford, and Stockport stopping outside of some of the the A&E departments where the wounded were treated a year ago, Manchester Royal Infirmary, Wythenshawe, and Salford Royal Hospital. I also visited Old Trafford, Etihad Stadium, Manchester City Centre, The Trafford Centre, and had lunch at the Bowling Green Pub in Chorlton. We also stopped at Manchester Arena at around 11.30pm, an hour later than expected as I was trying to mark the time a year on from the attack. But we took some time to reflect when we arrived then pushed on for the last section and finished around 1.30am. "Activity Saved" is a more artistic look at the run. Rules: Start and end on Garmin. Running in every shot. Don't acknowledge the camera (even though I'm holding it).